Have you wondered where all of the items from this update come from? The characters, the buildings, the decorations? Right after the jump we’ve the complete list of all the items in the Spring Cleaning update and where did they come from! Covered Wagon Dude, Where’s My Ranch? 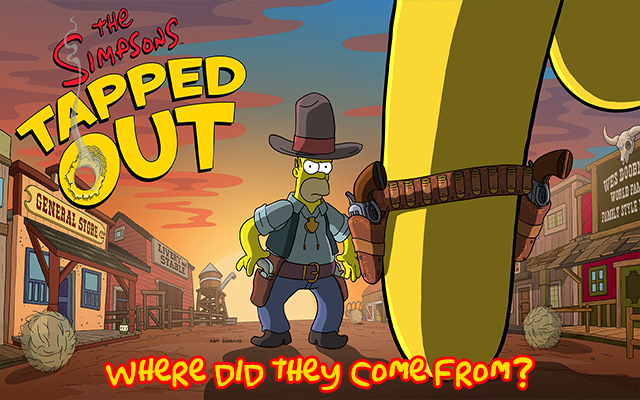 The following items are all The Simpsons: Tapped Out exclusives: Outlaw Snake, Big Bandit, Brutus, Town Plaza, Bank, Top Chop Barber Shop, Ordnance Express, Part and Parcel Postal, Hootenanny Barn, Wild West Film Set, Stage Coach, Hitched Horse, Frontier Cemetery, Mortician Carriage, Explosives, Forgotten Gold Treasure, Frontier Fence, Old Mine, Frontier Gate, Old West Sign, Cacti, Stock, Windmill, Deputy Credentials and Bandit Fort.